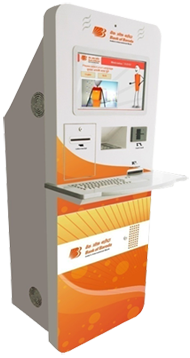 To provide hassle free and convenient banking services through alternate delivery channels to customer by leveraging Technology, Bank of Baroda has launched an innovative Self Service kiosk called Multi Function Kiosk (MFK). As the name suggests it offers a number of customer centric services from a single hybrid services box. Where the CTS system is not enabled, the machine is working as cheque deposit box with instant receipt. Branch staff has to remove cheques from MFK (Onsite/Offsite) and send these cheques to service branch as per normal clearing by following existing guidelines. Account number of cheque will be printed on the backside of cheque. Customer selects the cheque deposit menu. System asks the user to enter the A/C number in which the amount is to be credited. System fetches the A/C holder name from CB Sand show to the customer and gets confirmation. After confirmation, machine will prompt the user to insert the cheque. After processing of one cheque, machine allows depositing more cheques in the same account, if required by the user. Bill payment facility is available in MFK through internet banking and debit card based authentication. Customer can use any of the options i.e. his/her Internet Banking or Debit Card details to pay the Bill/Recharge Mobile / DTH etc. Customer needs to select the Bill category (Electricity, water, prepaid, postpaid etc.) from the icons and selects the Biller. System will validate the information entered by the customer and ask for Payment. On clicking Pay button, it would ask to choose the option of Debit Card/ Internet Banking. On click in Net Banking, icon customer needs to login with net banking credentials and pay the amount. On success/failure of the payment, machine would display appropriate message on the screen and customer gets the receipt. The customer will select view balance option under the Banking services. It would ask to swipe the card for authentication, thereafter, it will display the balance available in primary account and allow taking a print if desired by the customer. For mini statement, the customer will select the mini statement option under the Banking services. It would ask to swipe the card on machine for authentication, thereafter, it will display the last eight transactions held in primary account and allow to take a print if required.